Though Karen and I had been running on mountains, hills and trails throughout our time in South America, we had yet to run an actual race in 2015 until we returned to the states for the month of April. The second weekend after we arrived home we ran the Rockdale Ramblin’ 10K with Karen’s dad, Mark; last Monday I completed my first Boston Marathon; and this past Saturday team Victorious Secret completed our fourth annual River to River Relay (80-mile team relay race) in Southern Illinois. Running is a major part of the lives of the Kimble family, and it’s been wonderful to embrace that during the last few weeks. On Monday, April 20 (Patriot’s Day), I ran and completed my first ever Boston Marathon. It was truly a beautiful experience for a number of reasons, but most especially because of what the honor meant to me. When I began distance running with my first marathon in 2012, I thought I would be okay running one and being done with it. But, a few weeks later I signed up for the 2013 Detroit Marathon and I haven’t looked back since. After cutting a significant amount of time off of my first marathon, I decided that I really wanted to start pushing myself in the sport. For those of you who aren’t as familiar with the race, the Boston Marathon requires participants to “qualify” with a gender and age-based time in order to run the race. For me, as a male in the youngest age group, the qualifying standard is the hardest one: 3:05 (three hours and five minutes). So, I signed up for the Go! St. Louis Marathon in 2014 and targeted that as my hope to qualify for Boston. Putting in lots of extra miles and hard speed work for the race, I went to St. Louis last April and qualified with less than two minutes to spare! 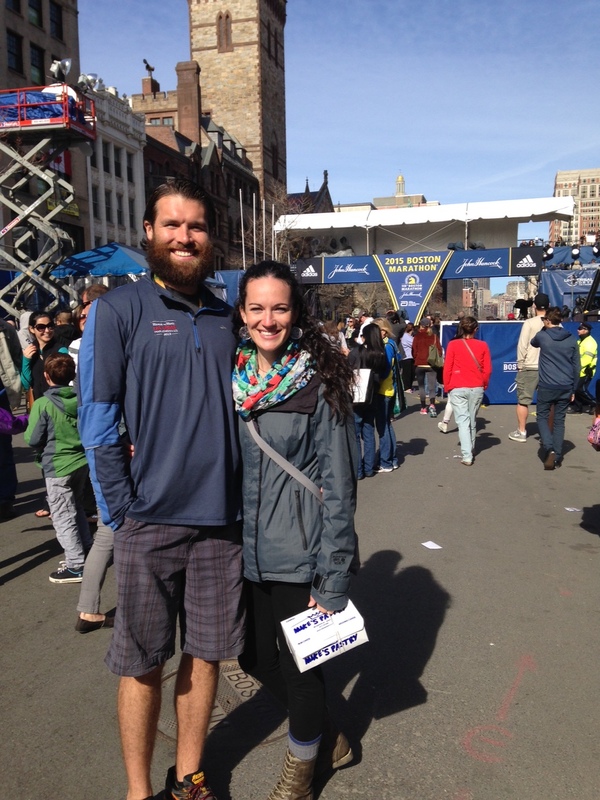 It was an incredibly emotional experience and I was so happy that I would be running Boston in 2015. I just didn’t know I would be coming back from overseas to do it! Karen and I at the finish line on Boylston Street the night before the race. The beauty of the Boston experience was hard to match. In spite of intense rain on the course and 20mph headwinds, I still had the time of my life running in one of the best races on the planet. Karen and our good friend, Nichole, were both there to support me on the course and make the experience that much more special. Due to some great planning and fortunate circumstances, they were able to see me three different times along a course that runs point-to-point! It’s hard enough to see someone three times on any course, much less one that runs in a direct line without any overlap. 1. The crowd and volunteer support. It was just amazing. As the course went winding through the various small towns, there were people everywhere cheering and lending support. 2. Running past the Boston College campus. After “Heartbreak Hill” between miles 20 and 21, runners enter through the campus area. The students were so loud and excited…talk about a late-race boost! And as I mentioned, much of that was throughout a cold, rainy and windy day! 3. The finish on Boylston Street. As you round the final turn to the finish line, the scene is electric. The beautiful image of the finish line and roaring crowds is forever etched into my memory! 1. The bus ride to the start line. In order to reach the start line, runners take a bus from downtown Boston to Hopkinton, where the race begins. The bus ride is an hour long and it required me to arrive at 6:30, even though I wouldn’t begin running until 10. 2. The down time at Athlete’s Village. After the bus ride, runners enter Athlete’s Village in Hopkinton. There are tents to lay down and items to eat and drink, but the runners still have more than two hours until the race begins. In many other races, you show up at the start line with thirty minutes to go and that’s it! 3. The weather! This year the weather was quite challenging with the rain and headwinds. In retrospect, I loved running such a memorable race in tough conditions and still coming away with a PR. 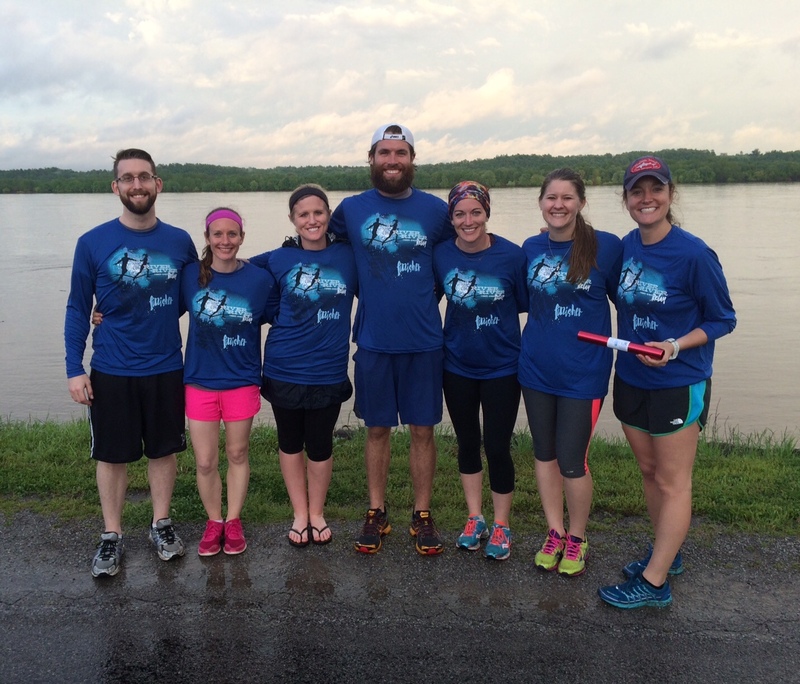 As for last weekend, the River to River Relay was once again a success! Our team battled through some severe weather and an ultimate cancellation of the race late in the day, but it didn’t stop us from crossing the finish line! Team Victorious Secret! Get it?